Police work from its very beginning was considered a male domain, far too dangerous and rough for a respectable woman to even contemplate doing, much less take on as a profession. A policewoman worked outside the home, walking dangerous city streets late at night to confront burglars, drunks, scam artists, and prostitutes. To solve crimes, she observed, collected evidence, and used reason and logic—traits typically associated with men. And most controversially of all, she had a purpose separate from her husband, children, and home. Women who donned the badge faced harassment and discrimination. It would take more than seventy years for women to enter the force as full-fledged officers. Yet within the covers of popular fiction, women not only wrote mysteries but also created female characters that handily solved crimes. Smart, independent, and courageous, these nineteenth- and early twentieth-century female sleuths (including a healthy number created by male writers) set the stage for Agatha Christie’s Miss Marple, Sara Paretsky’s V. I. Warshawski, Patricia Cornwell’s Kay Scarpetta, and Sue Grafton’s Kinsey Millhone, as well as TV detectives such as Prime Suspect’s Jane Tennison and Law and Order’s Olivia Benson. The authors were not amateurs dabbling in detection but professional writers who helped define the genre and competed with men, often to greater success. Pistols and Petticoats tells the story of women’s very early place in crime fiction and their public crusade to transform policing. Whether real or fictional, investigating women were nearly always at odds with society. Most women refused to let that stop them, paving the way to a modern professional life for women on the force and in popular culture. With high heels clicking across the hardwood floors, the diminutive woman from Chicago strode into the headquarters of the New York City police. It was 1922. Few respectable women would enter such a place alone, let alone one wearing a fashionable Paris gown, a feathered hat atop her brown bob, glistening pearls, and lace stockings. But Alice Clement was no ordinary woman. Stella Myers was no ordinary crook. The dark-haired thief had outwitted policemen and eluded capture in several states. Unfazed by Simon’s shocked expression, the well-dressed woman withdrew a set of handcuffs, ankle bracelets, and a “wicked looking gun” from her handbag. Holding up her handcuffs, Clement stated calmly, “These go on her and we don’t sleep until I’ve locked her up in Chicago.” True to her word, Clement delivered Myers to her Chicago cell. Alice Clement was hailed as Chicago’s “female Sherlock Holmes,” known for her skills in detection as well as for clearing the city of fortune-tellers, capturing shoplifters, foiling pickpockets, and rescuing girls from the clutches of prostitution. Her uncanny ability to remember faces and her flair for masquerade—“a different disguise every day”—allowed her to rack up one thousand arrests in a single year. She was bold and sassy, unafraid to take on any masher, con artist, or scalawag from the city’s underworld. Her headline-grabbing arrests and head-turning wardrobe made Clement seem like a character straight from Central Casting. But Alice Clement was not only real; she was also a detective sergeant first grade of the Chicago Police Department. Clement entered the police force in 1913, riding the wave of media sensation that greeted the hiring of ten policewomen in Chicago. Born in Milwaukee to German immigrant parents in 1878, Clement was unafraid to stand up for herself. She advocated for women’s rights and the repeal of Prohibition. She sued her first husband, Leonard Clement, for divorce on the grounds of desertion and intemperance at a time when women rarely initiated—or won—such dissolutions. Four years later, she married barber Albert L. Faubel in a secret ceremony performed by a female pastor. It’s not clear why the then thirty-five-year-old, five-foot-three Clement decided to join the force, but she relished the job. She made dramatic arrests—made all the more so by her flamboyant dress— and became the darling of reporters seeking sensational tales of corruption and vice for the morning papers. Dark-haired and attractive, Clement seemed to confound reporters, who couldn’t believe she was old enough to have a daughter much less, a few years later, a granddaughter. “Grandmother Good Detective” read one headline. Clement also had no truck with flirts. When a man attempted to seduce her at a movie theater, she threatened to arrest him. He thought she was joking and continued his flirtations, but hers was no idle threat. Clement pulled out her blackjack and clubbed him over the head before yanking him out of the theater and dragging him down the street to the station house. When he appeared in court a few days later, the man confessed that he had been cured of flirting. Not every case went Clement’s way, though. The jury acquitted the man, winning the applause of the judge who was no great fan of Clement or her theatrics. One person who did manage to outwit Clement was her own daughter, Ruth. Preventing hasty marriages fell under Clement’s duties, and she tracked down lovelorn young couples before they could reach the minister. The Chicago Daily Tribune called her the “Nemesis of elopers” for her success and familiarity with everyone involved in the business of matrimony in Chicago. None of this deterred twenty-year-old Ruth Clement, however, who hoped to marry Navy man Charles C. Marrow, even though her mother insisted they couldn’t be married until Marrow finished his time in service in Florida. Ruth did not want to wait, and when Marrow came to visit, the two tied the knot at a minister’s home without telling Clement. When Clement discovered a Mr. and Mrs. Charles C. Marrow registered at the Chicago hotel supposedly housing Marrow alone, she was furious and threatened to arrest her new son-in-law for flouting her wishes. Her anger cooled, however, and Clement soon welcomed the newlyweds into her home. The film created a sensation, particularly after Chicago’s movie censor board, which fell under the oversight of the police department, condemned the movie as immoral. “The picture shall never be shown in Chicago. It’s not even interesting,” read the ruling. “Many of the actors are hams and it doesn’t get anywhere.” Despite several appeals, Clement was unable to convince the censors to allow Dregs of the City to be shown within city limits. She remained undeterred by the decision. “They think they’ve given me a black eye, but they haven’t. I’ll show it anyway,” she declared as she left the hearing, tossing the bouquet of roses she’d been given against the window. When the cruise ship Eastland rolled over in the Chicago River on July 24, 1915, Clement splashed into the water to assist in the rescue of the pleasure boaters, presumably, given her record, wearing heels and a designer gown. More than eight hundred people would die that day, the greatest maritime disaster in Great Lakes history. For her services in the Eastland disaster, Clement received a gold “coroner’s star” from the Cook County coroner in a quiet ceremony in January of 1916. Clement’s exploits and personality certainly drew attention, but any woman would: a female crime fighter made for good copy and eye-catching photos. Unaccustomed to seeing women wielding any kind of authority, the public found female officers an entertaining—and sometimes ridiculous—curiosity. 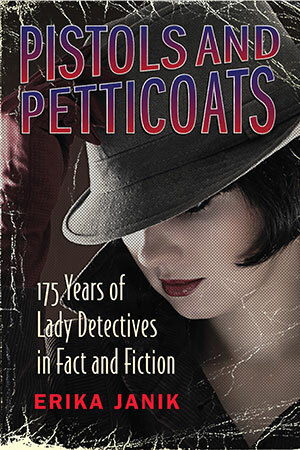 Excerpt from Pistols and Petticoats: 175 Years of Lady Detectives in Fact and Fiction by Erika Janik. Copyright © 2016 & 2017 by Beacon Press. Reproduced with permission from Beacon Press. All rights reserved. Readers Are Loving Pistols and Petticoats! Check out this awesome article in Time Magazine! Erika Janik is an award-winning writer, historian, and the executive producer of Wisconsin Life on Wisconsin Public Radio. She’s the author of five previous books, including Marketplace of the Marvelous: The Strange Origins of Modern Medicine. She lives in Madison, Wisconsin. Catch Up With Our Ms. Janik On: Website, Goodreads, Wisconsin Public Radio, & Twitter! Don't Miss Your Chance to Win Pistols and Petticoats! This is a rafflecopter giveaway hosted by Partners in Crime Virtual Book Tours for Erika Janik and Beacon. There will be 5 winners of one (1) print copy of Pistols and Petticoats by Erika Janik. The giveaway begins on March 3rd and runs through March 8th, 2017. The giveaway is open to residents in the US & Canada only. This entry was posted on Thursday, March 2, 2017 and is filed under Book Blast,Erika Janik,Giveaway,Partners in Crime,Pistols and Petticoats. You can follow any responses to this entry through the RSS 2.0. You can leave a response. Sounds like an interesting dose of both history and feminism! Agree! I love that it mixes the crime genre with historical fact. This sounds SO good! Just went on my list! You'll have to let us now how you like it!